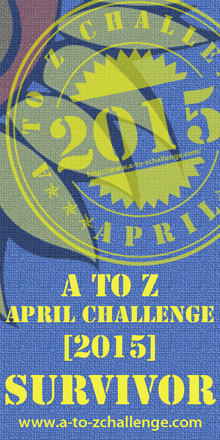 Today I’d just like to go over some of the posts I’ve made during the 2014 A to Z Challenge. Whether missing them, or new to the blog, feel free to check them out at your leisure. If feeling even more generous, I won’t hold it against you if you decide to “like” or “+1” any and/or all of them. No judgements here… If feeling chatty, you are always welcome to strike up a comment or three, whether here or on the original post. ABSENCE - It’s always good to have a return intro. CREATIVE COMMONS & FORBIDDEN ALCHEMY - Two entries focusing on creative hand-crafting projects I’m involved in. MOMENTS - A brief, light-hearted look highlighting exactly what the title says. NANOWRIMO - A small sampling of unedited fiction pieces from past NaNoWriMo events. Are there any posts during this A to Z Challenge that you care to share and/or highlight? Leave them below in the comments. Any important posts in general that I may not have had the chance to read/comment on yet?